Our next award goes to the movie that is the best Super Hero Jesus Reel Parable. And the award for best Super Hero Jesus Reel Parable goes to… Mad Max: Fury Road! Yeah, yeah, I know that this is not your typical Super Hero movie, but it is a fantastic Super Hero Jesus Reel Parable! He gives of himself to help others. He empties himself to save others. He sacrifices of himself to save others. And let’s not forget the blood! Max is more than “blood bag.” Max is actually a universal donor. Max’s blood saves. And he gives it freely to save Furiosa. Why? Because he is a Super Hero Jesus! And remember the “living water.” Max’s sacrifice results in the living water being made available to everyone. Yes, his sacrifice saves everyone. Hey, if you don’t already own Mad Max Fury Road and plan to buy it, please consider using this link. It won’t cost you anything more, and it will help us out here at Reel Parables. Thanks! Our first award goes to the movie that is the best Prodigal Son Reel Parable. And the award for best Prodigal Son Reel Parable goes to… The Martian! This one was easy because The Martin is a fantastic retelling of the Lost Parables, especially the Prodigal Son. Mark Watney (Matt Damon) is lost on Mars. Presumed dead, his team leaves him behind when they evacuate Mars due to a deadly storm. Yeah, he isn’t “lost” because of his actions, but he is lost. But he is also valuable. While the team on Earth tries to figure out a way to get him home, his crew mates decide to go rogue, return to Mars, and try to save him. They go back to Mars to find the prodigal. These crew mates are willing to sacrifice their wants and their desires (going home, seeing their families, etc.) to return to Mars to save him. They sacrifice to find him. That, at its core, is the story of the Lost Parables. Hey, if you don’t already own the Martian and plan to buy it, please consider using this link. It won’t cost you anything more, and it will help us out here at Reel Parables. Thanks! If you are like most of my readers, you’re probably not a huge fan of Twenty One Pilots. And to be honest, neither am I. But, also like me, you probably know someone who likes, or even loves, Twenty One Pilots. I first heard about Twenty One Pilots a few weeks ago from one of my 7th grade AWANA boys and didn’t even know it was them the first time I heard their new single, Stressed Out. So why should you care about Stressed Out by Twenty One Pilots? Because you can use this song to share God’s story. We can use the song Stressed Out to Share God’s story because it points us to the book of Ecclesiastes. Regardless of the translation, the point stays the same. Twenty One Pilots puts it like this. This longing for something new, for something unique, is not new and it is not unique to Twenty One Pilots. It actually sounds a lot like Solomon in the book of Ecclesiastes! Here is how I used Stressed Out to share God’s story with my AWANA kids. I let them get to the point of Ecclesiastes first before I brought it up. I basically let them agree with the Bible (in this case Ecclesiastes) before I bring up the Bible. Once they got there, I read Ecclesiastes 1:8-11 and helped them see that Twenty One Pilots is singing about the same stuff, the same ideas, that Solomon wrote about! What exists now is what will be, and what has been done is what will be done; there is nothing truly new on earth. Is there anything about which someone can say, “Look at this! It is new!”? It was already done long ago, before our time. Whether you like this song or not, we can use it to share God’s story – in this case with Ecclesiastes – with our kids and students. But don’t end with simply agreeing that Stressed Out sings about Ecclesiastes; do what Ecclesiastes does and point your kids and students to God! Yes, life if vanity, life is futility. It goes on and on. We are here and we will eventually be gone, but life goes on. I don’t mean to sound morbid, but that is the case that Ecclesiastes makes. And I know now this is true in my life. When our son died we were shocked that life went on. The day-to-day was still the day-to-day. So yeah, we desire to be unique and creative, but fail since there is nothing new under the sun. As Ecclesiastes shows, this should drive us to God. Fear God and obey Him. It is in God that we find our true identity and our true purpose. So, how can YOU share God’s story with Twenty One Pilot’s Stressed Out? Do you have a kid or student who really likes this song? If so, you have an easy “in” where you can share God’s story! Part 1 was all about seeing a pattern. There is a corrupt world, usually with a counterfeit king or ruler. There is typically an outside – and dual natured – hero (savior) who is not a part of the corrupt world. The Hero will almost always sacrifice something, often his/her life. If the hero dies, he/she will often be resurrected or reborn. If the hero does not die, the world is often restored to its former glory. Also, relationships are restored and reunited. This resurrection/restoration usually leads to community (restored relationships) and a calling. In Luke 15 Jesus told three Lost Parables; one about a lost sheep, one about a lost coin, and another about two lost sons. In each of these stories we get to see what Jesus is like. The shepherd went looking for one lost sheep, even though he had 99 others. Why? Because that one sheep was important to him. We are that important to Jesus. Jesus loves you the same way. The woman went looking for one coin, even though she has 9 others. Why? Because that one coin was valuable to her. You are that valuable to Jesus. Jesus loves you the same way. Finally, a father had two sons. While both wanted the father’s blessing/wealth, neither wanted the father. One got his inheritance early, ran away, and blew it. The other stayed, had access to all the father’s blessings, but ignored it. Both sons had issues, not just the proverbial “Prodigal Son.” The father loved – and longed for – both sons. In each of these stories we see Jesus’ character. Jesus loves and cares for us the way the shepherd loved and cared for the one lost sheep. Jesus finds us valuable in the same way that the woman found the one lost coin valuable. Jesus longs to be with – and share His blessing – with us, just like the father wanted to give his blessing on his two sons. This story – God looking for what was lost – goes all the way back to the beginning, all the way back to Genesis. Adam and Eve had sinned. Adam and Eve were ashamed. Adam and Eve tried to hide from God. But God went looking for them. Yea, I know God knew where they were. But He was calling out to them, “Where are you?” They were lost and God went out to find them. These three lost parables retell our story. Like the sheep, like the coin, and like the children (sons), we too are lost. Because of our sins we are separated from God. Me. You. Your parents. Your kids. Everyone. But just like the shepherd searched for the sheep, just like the old woman searched for the coin, and just like the father was looking out for his son, Jesus chases after us. Yes, while we were still sinners – and therefore lost (separated from God) – Jesus demonstrated His love for us by dying for us. Jesus died for us while we were sinners. Jesus died for us while we were still lost. Jesus died for us while we were separated from God. FYI – Hollywood can’t stop remaking and retelling the Lost Parable. Nemo is literally “caught up in his sin.” He disobeys his dad, Marlin, and is caught by a diver with a net. How do you know Marlin still loves Nemo, even though he disobeyed? Because he went looking for him! Finding Nemo is the parable of the lost fish. The next time you watch Finding Nemo with your kids remind them that they are like Nemo and lost because of their sin. But also remind them that Jesus loves them the way Marlin loved Nemo! And just like Marlin went looking for Nemo, because he loved him, Jesus is looking for them (and died to save them)! Elsa, ashamed and afraid of her own actions, runs away. She is the lost sister. But Anna, the sister she left behind, loves her and went out looking for her lost sister. In this story we are Elsa, the lost ones, and Anna is the Christ character. She even died to save Else like Jesus died to save us. And just like Jesus rose from the dead, so did Anna! Jesus loves us the way Anna loved Else. The next time you watch Frozen with your kids remind them that they are like Elsa and lost because of their actions. But also remind them that Jesus loves them the way Anna loved Else. Not only did she go out looking for Elsa, but she died to save her. Just like Jesus died for us. Not all Hollywood Lost Parables are for kids. Saving Private Ryan is a Lost Parable for adults. Private Ryan is lost at war and a group of soldiers are sent to find him. Like Jesus did for us, these men sacrificed their own lives to save Private Ryan. Yes, Jesus demonstrated His own love for us in that while we were still sinners, He died for us! 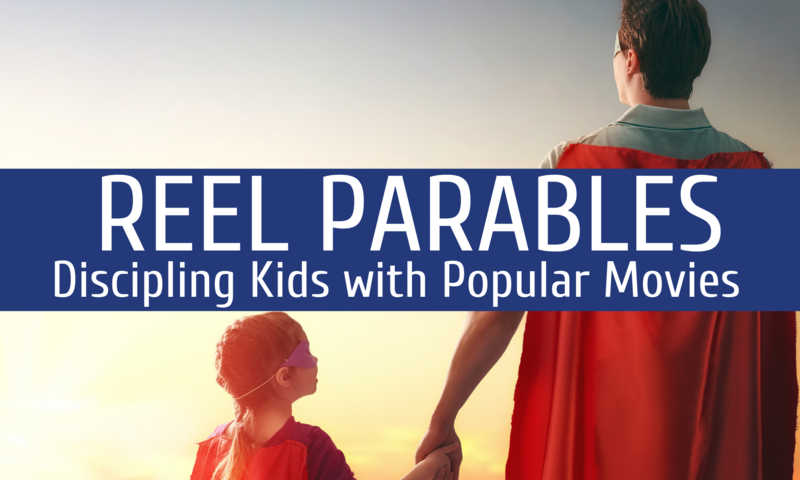 Yes, the Lost Parables are powerful. We get them. We understand them. They move us. Why? Because the Lost Parable is our story. Be on the look out for this type of Reel Parable. Someone is lost, usually due to their actions (sins). Someone, the hero and Christ-figure, will chase them and try to find them. This hero will usually sacrifice something to save them, usually their life. That sacrifice usually leads to resurrection or restoration or reunion. You can share God’s story the next time you see this Lost Parable in a movie! I know this is a lot, so In addition to the worksheets above, I have also combined all three parts into one free e-book, How to Share God’s Story with Movies. This free download will help you share God’s story with your kids and students by showing you how to see God’s story in movies.